thEsamO – thEjas? – Is that anything great? I will say “emperumAn is the controller/leader of nithyasUris”. If I say so, is that anything great? [No. Because ] He has placed his infinite attachment towards me (who is directly opposite to him being the abode of auspicious qualities only and being opposite of all blemishes) who is downtrodden (being filled with inauspicious qualities) and having no completeness (acquired through auspicious qualities). (Due to that) one who is firmly staying in thirumalai (where his simplicity is revealed) acquired perfect radiance and is having fully radiant form [Blessing me who is downtrodden, brings him so much more glories than blessing nithyasUris who are already pure]. Isan vAnavarkku enban – I said “He is the controller of nithyasUris”. adhu thEsamO thiruvEnkataththAnukku – For the one who has descended to thirumalai, and standing here manifesting his simplicity, is “being the leader of nithyasUris” something great? I became confused and started glorifying SrIvaikuNtanAthan since that (being the controller of nithyasUris) is great for SrIvaikuNtanAthan and not thiruvEnkatamudaiyAn [he has some other greatness]. 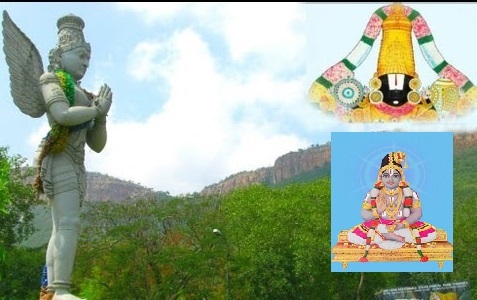 For the one who left paramapadham to be identified with this divine hill, who is presenting himself for the forest, monkeys and hunters, giving his presence for nithyasUris is not something admirable. While bringing out the glories of an emperor, he cannot be glorified citing his visits to jail [to supervise etc] [So, SrIvaikuNtanAthan cannot be glorified citing his presence in thirumalai]. Should I not be saying “nIsanEn niRai onRum ilEn enkaN pAsam vaiththa param sudarch chOdhi“? Instead of saying this, should I be saying that [that, he is the controller of nithyasUris]? nIsanEn niRai onRum ilEn – AzhwAr is saying that if a form is made with “inferiority and not having any good qualities”, that will be him. nampiLLai beautifully brings out AzhwAr‘s divine emotions through sthOthra rathnam 62nd SlOkam. amaryAdha: nrupaSu: – As a nrupaSu: (animal in the form of human) that would not distinguish between the mother that gave birth and other beings [when it comes to having physical relationship, (some) animals don’t distinguish]. (amaryAdha:) I practiced those activities that were forbidden in SAsthram and became immersed in such activities. kshudhra: – When some one says “you cannot ignore SAsthram maryAdhai (the orders of SAsthram)”, I don’t have the heart to accept that. asUyA prasavabhU: – I cannot even tolerate the person who advised for my well-being. kruthagna: – For such persons who helped me, instead of being grateful, I caused them suffering. dhurmAnI – Not only I caused them suffering, I also considered myself greater than them. smara paravaSa: – While I considered myself greater than the wise people, I also considered myself subservient to lusty women. vanchanapara: – I would steal from others and bring that to a woman; once a lump sum is accumulated at the woman’s place, I would steal that too. nruSamsa: – Not even feeling bad thinking “I have cheated those who trusted me”. pApishta: – I would repeatedly do this. I would be immersed in sins. nIsanEn niRai onRum ilEn – ananthAzhwAn would say “Though this SlOkam was blessed by ALavandhAr, I would not dare saying it [since I may accidentally come to think that a tiny little bit of these blemishes may be present in ALavandhAr]. nIsanEn niRai onRum ilEn – Two explanations. I only have anAthmaguNams (bodily/inferior qualities) and no AthmaguNams (natural/superior qualities) [so being my lord, adds to his glories of accepting even the most downtrodden] [This explanation focusses on “For thiruvEnkataththAn who is paranjudarchchOdhi who placed his attachment on me who is inferior and has no good qualities – if I said ‘vAnavarkku Isanenban‘ (he is the lord of nithyasUris) – is there anything great in that?”]. piLLai thirunaRaiyUr araiyar would say that AzhwAr is explaining this as “It is because of my inferior nature and not having any good qualities, I am saying this [Isan vAnavarkkenban (he is lord of nithyasUris)” [since it is better to be the lord of nithyasUris than me]. [This explanation focusses on “Because I am inferior and have no good qualities, I proclaim him to be the lord of nithyasUris. For thiruvEnkataththAn who is the paranjudarchchOdhi who placed his attachment towards me, is there any glory in me saying that?”]. en kaN pAsam vaiththa – One who placed his love towards me. He placed his control over nithyasUris. But he had his attachment towards me. He united with them to sustain them. He united with me to sustain himself. They are like the first wife (crowned-queen) – who is given priority [in official circles], given some wealth etc., to avoid being blamed if she wears saffron robes and goes for begging. But I am like his dear wife in whom he has placed his heart, body. Alternatively, it is also explained by some as AzhwAr saying that emperumAn triggered my attachment towards him. That is, “enkaN (in me) pAsam (attachment towards him) vaiththa (placed)”. param chudarch chOdhikkE – His bodily radiance shows that he did not unite with me without real interest in his heart just to convince others, he engaged with me with all his heart. He was shining. After uniting with me, he acquired new radiance. He stood shining like he would after uniting with SrI mahAlakshmi. This entry was posted in thiruvAimozhi, thiruvAimozhi 3rd centum on August 5, 2016 by Sarathy Thothathri.